So I love history, and especially Latin American history, so instead of talking about Catalonia or comida or las Carlistas or a million other topics that begin with C, I'm going to share a little bit about one of Spain's most famous historical figures, Hernán Cortés. Anyway, history at its most basic will say that Cortés marched through Mexico to Tenochtitlan, the capital city of the Aztec Empire, and with only a few hundred men and some horses, took down thousands upon thousands of natives, largely due to the smallpox they brought with them. But that's not what makes him interesting. Conquests had been going on for centuries, and though it's interesting that the Aztecs might have believed him to be a god (though there's a lot of speculation about that), it's not what intrigues me. 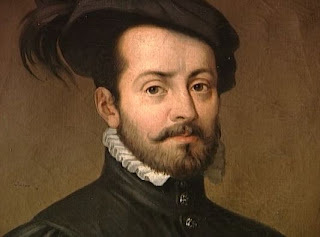 In 1518 the governor of Cuba, Diego Velázquez, sent Cortés on an expedition to conquer Mexico, but soon changed his mind, and revoked his permission. Cortés ignored that, and when Velázquez arrived on the mainland in person to tell Cortés off, he replied with, "Sorry, gotta go," and quickly fled. He then founded a town and made himself leader, which hypothetically excused him from being under the Governor of Cuba's authority. Hypothetically. Of course, some of his men had doubts. Cortés didn't exactly have experience leading an army, and who was he to defy the governor of Cuba? Cortés, sensing that many of his men wanted to desert, scuttled every ship except one, which he sent back to Spain, literally trapping everyone on mainland Mexico, with no choice but to proceed. To me, this little anecdote is what makes him most interesting. Are these admirable actions? No, definitely not, especially considering that it led to the deaths of thousands of natives. But it was ridiculously courageous--and certainly insane--to scuttle his own ships, stranding himself and some 600 men in a place that very few Europeans had ever visited. Don't get me wrong: by no means do I condone his actions. In fact, he's ranked pretty darn high on my list of historical jerkwads. But there's no denying that he was, well…a badass, at least in some respects. Here in Spain, you'll find quite a few paintings and statues dedicated to him. The General Archive of the Indies in Seville is filled with them. It's definitely interesting, since in the U.S., his history is always tinted with negativity: "Hernán Cortés, a bad guy." Since being here, my opinions about that haven't changed--Cortés and the conquistadores brought a lot of misery--but it's strange to see memorials to them. But it goes both ways: Why is Andrew Jackson, the man behind the Trail of Tears, commemorated every time we pull out a twenty? America doesn't like Cortés. To most, he's a mass murderer. But to Spain he's technically a hero, even if nowadays a lot of Spaniards don't exactly approve of his actions. His conquest of Mexico was the beginning of Spaniards taking over the rest of mainland Latin America, save Brazil. Keep in mind that Spain only became one unified country in 1492, so how awesome must it have been for this brand new country to 1) "discover" the New World, and 2) exploit its resources until it was one of the richest nations around, which enabled it to have an armada to rival the British Navy. In less than a century, it went from being a cluster of very divided kingdoms, largely controlled by North African Arabs, to the most powerful empire in the world. An evil empire, according to the French and British, who felt both jealous and threatened. C is for Competition, right? Spains rise to power, which has a lot to do with Cortés, reminds us that there are two sides to every story. A villain isn't a villain to everybody, and the same goes for heroes. The best characters are those whose good/evil alignment isn't clear, and it all depends on your point of view. 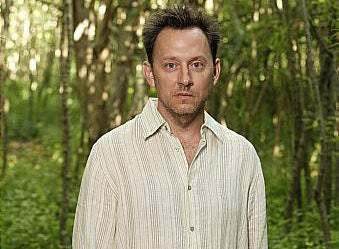 The one that immediately comes to mind is Ben Linus from ABC's Lost. Three years after the end of the show, I still have no idea whether to consider him a good guy or a bad guy. ABC is doing it again with Once Upon a Time: Where on the scale does Rumplestiltskin/Mr. Gold lie? (Interestingly, these characters also tend to be the best actors). How about Javert from Les Miserables? He is the "bad guy" of the novel/musical/movie, but if you look at the story from his perspective, he's doing what society normally approves of: attempting to stop a wanted thief. If Les Miz were not fiction, but was a true story playing out in our own modern society, we would probably applaud Javert for seeking a potentially dangerous criminal. "Of course not," you might say. "Jean Valjean is a really good man." "Yeah," I'd reply. "But how often to you stop to chat with the criminal about his emotions, morals, dreams, family life, etc? You don't." But because Les Miz gives us Jean Valjean's PoV, we view him as the hero, while Javert is stuck being the villain. So keep that in mind when writing! To some, your bad guys might not actually be bad guys--and those kinds of characters tend to be the most interesting.